Definition at line 37 of file CTableauMatrix.h. Definition at line 36 of file CTableauMatrix.cpp. Definition at line 65 of file CTableauMatrix.cpp. Definition at line 95 of file CTableauMatrix.cpp. References CTableauLine::isReversible(), isValid(), mFirstIrreversible, mLine, and pdelete. Definition at line 75 of file CTableauMatrix.cpp. 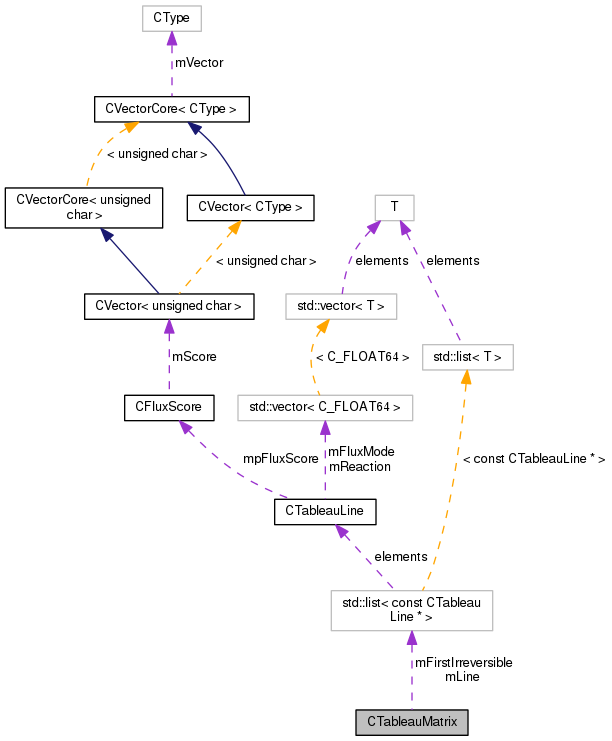 Referenced by CEFMAlgorithm::buildFluxModes(), CEFMAlgorithm::calculateCombinations(), CEFMAlgorithm::calculateNextTableau(), and CEFMAlgorithm::CSpeciesOrderNode::update(). Definition at line 80 of file CTableauMatrix.cpp. Definition at line 85 of file CTableauMatrix.cpp. Definition at line 90 of file CTableauMatrix.cpp. Definition at line 138 of file CTableauMatrix.cpp. References CTableauLine::getScore(), mLine, and removeLine(). Definition at line 119 of file CTableauMatrix.cpp. Referenced by CEFMAlgorithm::calculateNextTableau(), and isValid(). Definition at line 72 of file CTableauMatrix.cpp. Definition at line 176 of file CTableauMatrix.cpp. Definition at line 53 of file CTableauMatrix.h. Definition at line 48 of file CTableauMatrix.h. Referenced by addLine(), begin(), end(), isValid(), operator<<(), removeLine(), size(), and ~CTableauMatrix().